In this wild Western Minnesota musical theater adventure, a young Appletonian races against the clock on a journey through time to save his love and his town from the scheming villain Richard Nixon (Yes, you read that right). Our audience of 250 traveled with the actors through the streets and stories of Appleton, meeting the characters who made this town great. The performance began at the WPA-era Appleton Bath House and traveled to seven more sites around Appleton, including the original site of the Appleton Mill, a city camp site next to the Pomme de Terre River, the Riverview Park Bandshell, the future site of the city playground, The Veterans Memorial, Main Street, and the ’52 Wing of the old Appleton High School. Listen to an amazing interview with cast members Hope Schmidt and Paul Raymo on the radio station KDIO (with pictures from the production!). They discuss the full story of the show and the process of creating it. Another very cool note about this interview is that Paul and Hope are both DJ’s on the “competing” radio station KLQP. We worked for 9 months on this production, holding story swaps in town and collecting stories from Appleton residents. 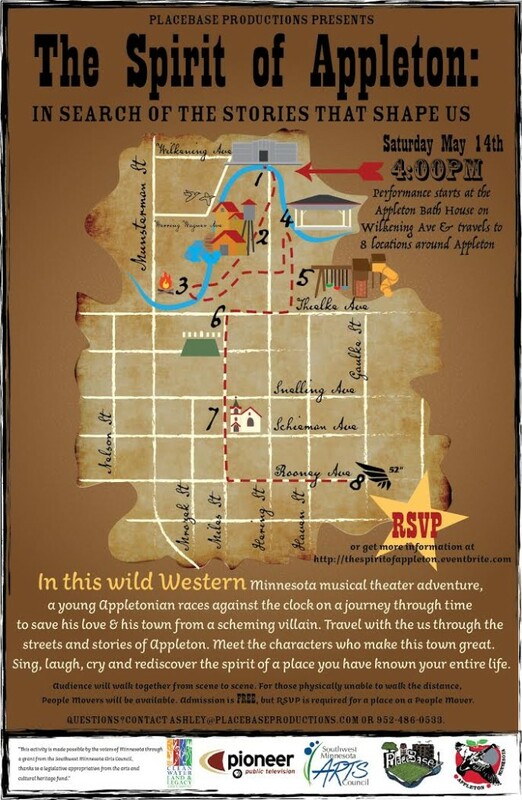 We raised a cast of over 50 residents from Appleton and the greater Minnesota River Valley to put this play on. We are so thankful to every person who gave us their stories, hosted us on our trips to Appleton and participated in the play as actors, singers, musicians and technicians. This activity was made possible by the voters of Minnesota through a grant from the Southwest Minnesota Arts Council, thanks to a legislative appropriation from the arts and cultural heritage fund.